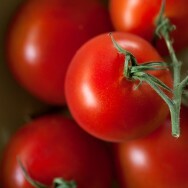 Just as the “dog days of summer” seem to pass us by in the blink of an eye, so does the season for farm fresh tomatoes. So when the temperature drops and darker days approach, break out the tins of tomatoes and let the season for hardy comfort food begin! Whether you’re preparing chicken cacciatore, spaghetti bolongese or minestrone, a modest tin of tomatoes can be the start of something great. So stock your pantry with tomatoes and dinner will never be dull!